Durable and Eco Friendly - Say no to single-use plastic straws. One reusable straw can save thousands of plastic straws from polluting our landfills and oceans. 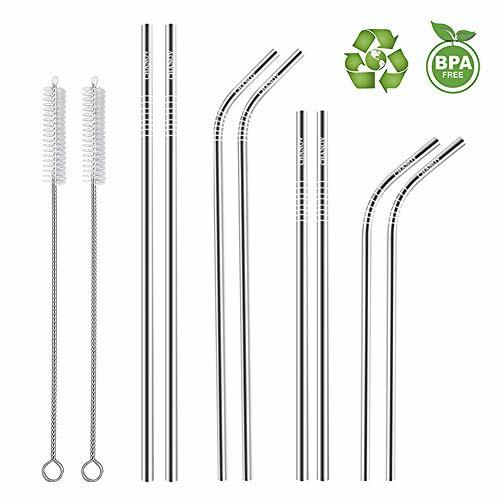 This metal straw is made of food-grade 18/8 stainless steel, won\'t rust, scratch, chip or break, no metal aftertaste, durable and reusable, is a perfect replacement for plastic straws. Widely Use - Reusable metal straws add fun to any party, trendy for family reunion, office use, girl\'s night out, cocktail party, Patio BBQ, picnics, boating and more! Can also act as a Stirring Rods to use, perfect for drinking cold beverage, sipping cocktail,coffee, ice tea, fruit juice, etc. Safe and Easy to Clean - The stainless steel straw edges are very smooth. So they would not hurt your lips and scratch the cup bottom. Come with 2 cleaning brushes to clean the stainless straws thoroughly. Please wash the metal drinking straws with the soap carefully before the first use. 100% Satisfied Guarantee - If you have any issue with our products, please feel free to contact us, and we will try our best to make it right. No risk, order now! no complaints at all - stop buying straws today! Great straws, cleaning brush helps. Go green, eliminate plastic!